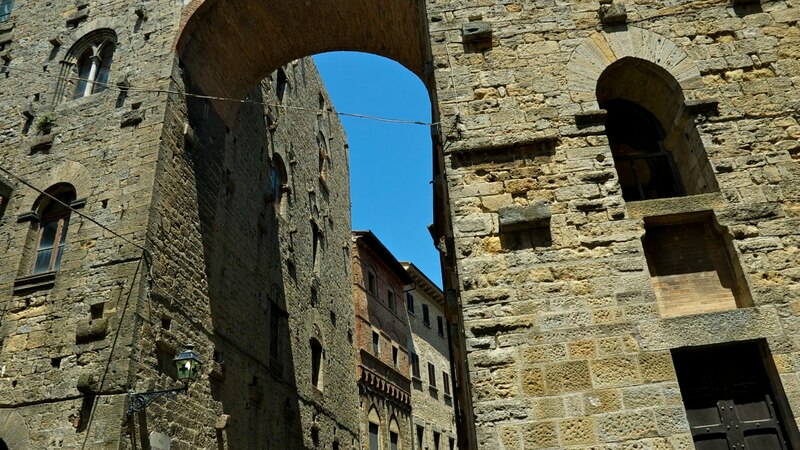 Volterra has always been present in Tuscan history. 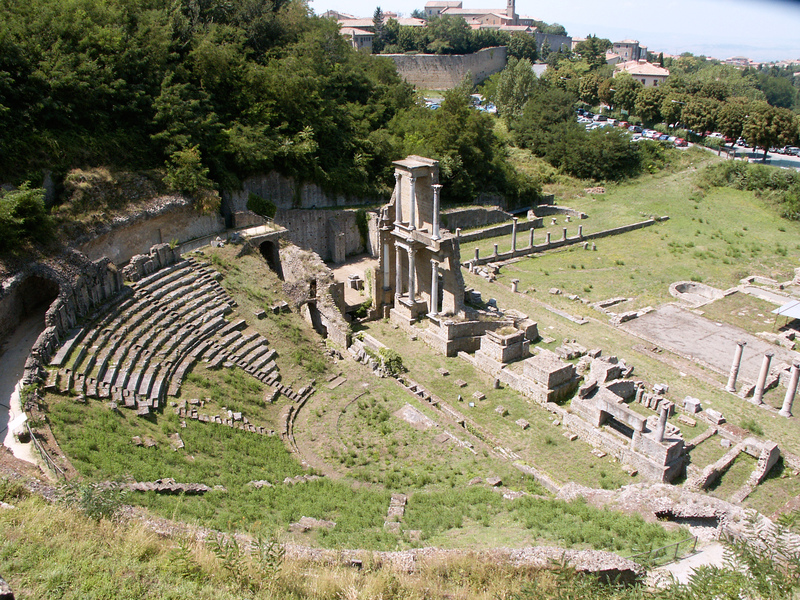 Founded by the Etruscans in a commanding position on a craggy hill overlooking the Cecina and Era Valleys. The ancient “Velathri” was one of the twelve cities of the Etruscan confederation, with a circle of cyclopic walls of which significant portions still stand. It dominated Elba and Corsica, and with a population of 25.000 inhabitants, it was a flourishing centre for metal trading and the production of timber, wheat and alabaster. The Roman City of “Volaterrae” fell rapidly into decline after construction of the trans-Appennine Pisa-Tortona route. In the 5C it is the seat of a bishop and of a count. After the year 1000 episcopal power passes to the Pannocchieschi Family, but from the 13C onwards it is superseded by the free commune. In 1361 it comes under Florentine influence, against which it rebels during the rule of Lorenzo Il Magnifico. The “War of Volterra” and the sack which ensued brought about definitive decline. 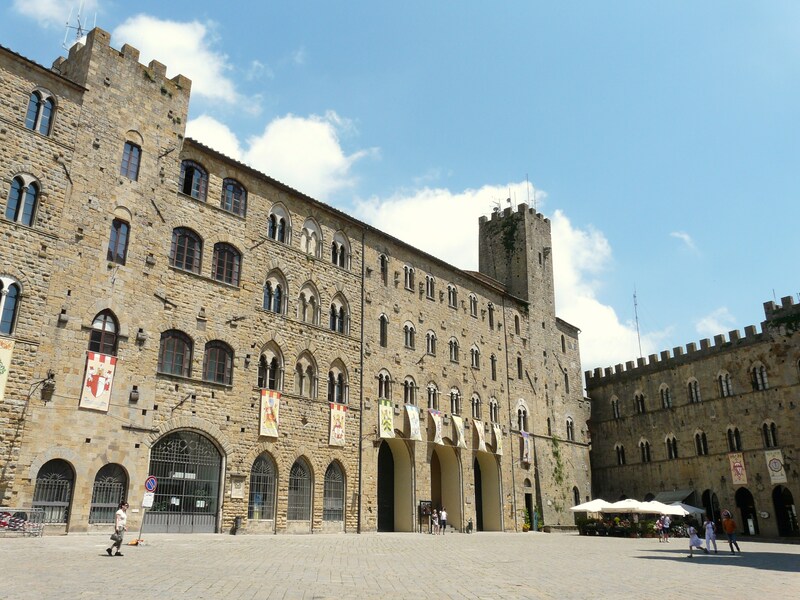 Today Volterra is an industrial, agricultural and tourist centre, with many alabaster workshops. The Piazza dei Priori, market-place since 9C, is one of the most interesting medieval squares in Italy, surrounded by austere palaces: the Palazzo Vescovile, the Palazzo Pretorio with its incorporated Torre del Podestà, the apse of the Cathedral and, next to it, the Palazzo dei Priori, built in 1208-54. 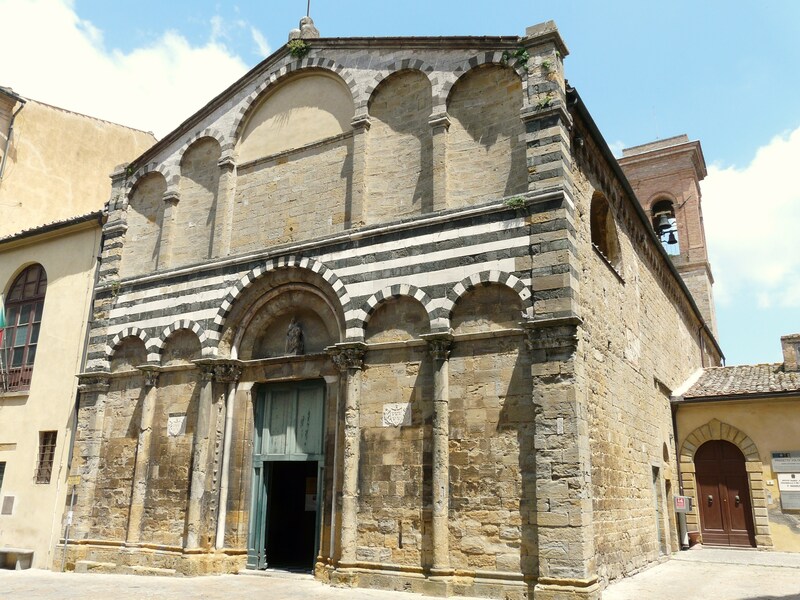 The Duomo is a Romanesque building (12C-13C). 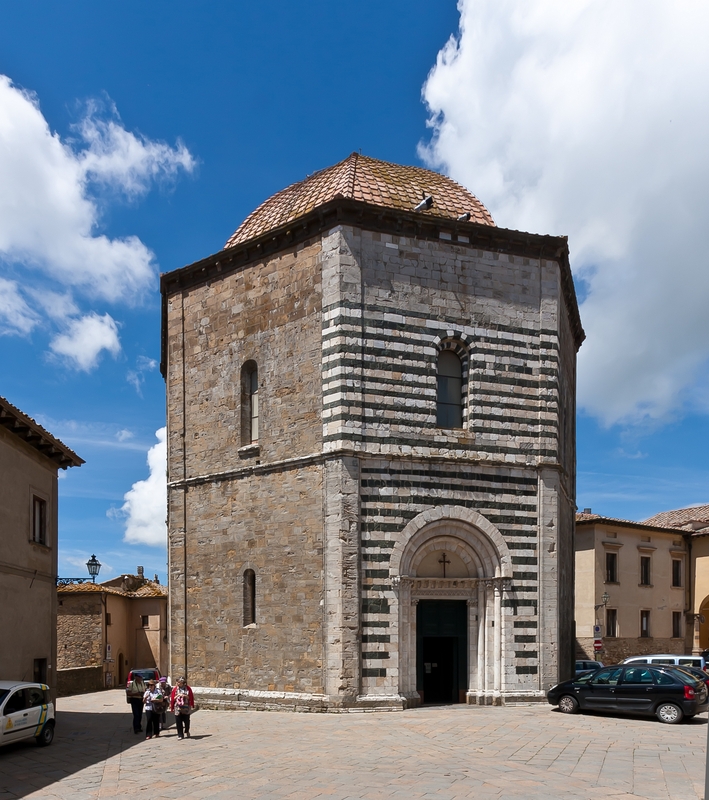 It is flanked on the left by the Chapel of the Addolorata on which leans a Quattrocento bell-tower. Inside a ciborium by Mino da Fiesole and frescoes by Benozzo Gozzoli. Facing the Cathedral is the Baptistry. In the Quadrivium dei Buonparenti, of typical medieval inspiration, rise some characteristic Duecento Tower-Houses, one of which is the Buonparenti Tower-House, connected with Buonaguidi Tower along a bridge. In Piazza Inghirani is the Church of San Francesco; inside the Chapel della Croce di Giorno, a Gothic hall frescoed by Cenni di Francesco di Cenni (1410). In the Palazzo Solaini are housed the Pinacoteca and the Civic Museum. There collections of works by Florentine, Sienese and Voterran artists from the 14C-17C, including Domenico Ghirlandaio, Luca Signorelli, Rosso Fiorentino. On the highest point of the city rises the grim Fortress, today a prison; at the end of the western ramparts we find the “Enrico Fiumi” Archaeological Park with the remains of an Etruscan-Roman acropolis. The “Mario Guarnacci” Etruscan Museum houses a collection of antiquities from prehistoric times to the Roman Imperial age, with sculptures (“The Shadow of the Evening”, an Etruscan votive bronze figurine of the 3C BC), a vast collection of Etruscan funerary urns in tufa, alabaster and terracotta (the superb “Urn of the Married Pair”, 1C BC) and a collection of coins. 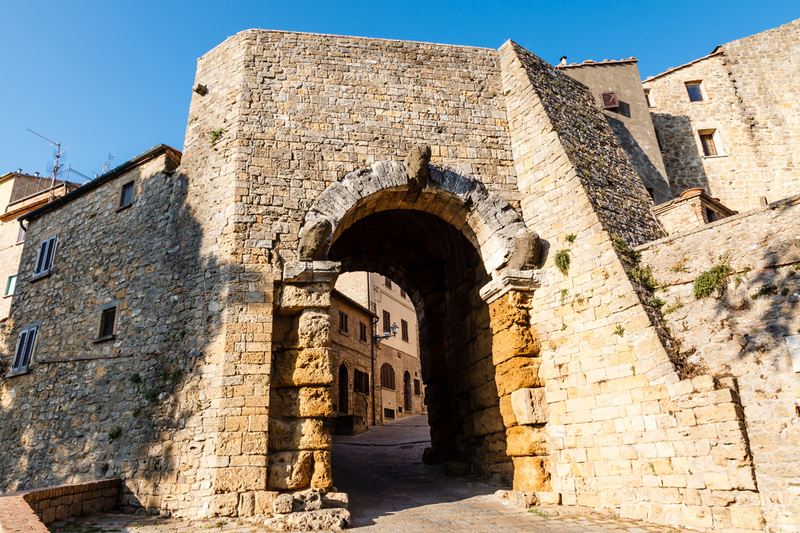 The typical Via Matteotti and the Via Porta dell’Arco which leads off from it, with many alabaster workshops, ends at the Arco Gateaway, once part of the Etruscan ramparts of the 4C-3C BC. Well worth a visit are the nearby Balze, an awe-inspiring series of precipices furrowed by gully erosion. Not far off is an Abbey, founded by the Camaldolensians in 1030. A few km away is a medieval hamlet, Montecatini Val di Cecina, with a 12C tower (all that remains of a fortress), the Palazzo Pretorio and a Romanesque-Gothic Parochial Church. To book a villa, farmhouse or apartment in Tuscany you can have a look at our beautiful properties!